Few legal sites inspire more awe – and as a result, readership – than SCOTUSblog, which provides timely and accessible analysis of the U.S. Supreme Court for lawyers and non-lawyers alike. With the Court set to hear argument this morning in Shelby County v. Holder challenging Section 5 of the Voting Rights Act, SCOTUSblog’s Lyle Denniston (a renowend Court guru) offers his take on the various options available to the Court. It’s worth a read … you can also follow summaries of the arguments at SCOTUSblog. Is this the ultimate test? Four years ago, the Supreme Court walked right up to the brink of striking down a federal law that is widely credited with having done more than any other to reduce racial discrimination in voting in America — the Voting Rights Act of 1965. Then, the Court backed off, and chose a much narrower way to decide that case, Northwest Austin v. Holder. No one outside the Court knows for sure why it hesitated. Perhaps it was to give Congress a chance to think over whether the law needed updating, as the Court had implied. Perhaps a majority just may not have been ready to scuttle this law with the remarkable history it has behind it. Now, the Court is being asked once more to decide the ultimate constitutional question. The situation may be different now: Congress did not respond the last time around, the challengers since then have only intensified their legal challenge to the law, the Court majority may already have tipped its hand, and, besides, the fundamental issue would not easily be put off again. Whatever the Court does, the real-world effect is likely to be wide-ranging. Either the law will have survived its most severe test, it will be gone, or it will remain on the books, but probably in a pared-down version, perhaps not as effective in a real-world sense as it has been. What, then, are the Court’s actual choices — from most far-reaching to least? This case gets its greatest importance from the fact that what is at stake is the basic scheme of the Act, its most fundamental approach to equal voting rights — and the part that has actually worked most effectively. It requires the states, counties, cities, and local subdivisions that are covered by Section 5 to get clearance from Washington before they may put into effect any change in their election or voting procedures. That takes away a core power of their self-government, and that was precisely what Congress intended, because it found that that power had been abused often to curtail minorities’ voting rights. Which state and local governments are covered is determined by the law’s Section 4. That is based upon their past history of racial discrimination, based upon voting data that was last updated by using 1972 as the base. That is what its critics say makes it out of date; it no longer reflects the reality of voting rights in those jurisdictions, they say. Four years ago, the Supreme Court credited that complaint, saying that the continuing obligation had to depend upon current situations. To go the furthest in doing away with the 1965 Act’s basic scheme, the Court could strike down both Section 5′s “preclearance” requirement, and Section 4′s coverage formula. It could do so based on any one or more of four constitutional arguments. (1) whatever power Congress once had to enforce the Fifteenth Amendment’s ban on race bias in voting, it cannot single out some states and local governments and leave them stuck in a time period that ended four decades ago; (2) whatever power Congress has to enforce the Fourteenth Amendment’s guarantee of legal equality, it cannot do so by discriminating in enforcement based on an out-of-date scheme; (3) the Constitution reserves for the states, under the Tenth Amendment, their basic right to self-government, especially regulating the right to vote, or (4) Article IV of the Constitution assures the challenging states that they are equal to all other states in their rights of self-government. If both sections are invalidated, what would be left of the 1965 Act would be its Section 2, which is not being challenged in this case. Section 2 applies nationwide, and allows the government and private individuals and organizations to sue any state or local jurisdiction with a claim that its voting or election processes have a discriminatory impact on minorities. Those would be case-by-case lawsuits, with the burden of proof on the challengers to show discrimination exists now, rather than on the states or local governments to show that they are not discriminating. The Court, changing its mind in a wholesale way from what it said the last time it questioned the Act’s validity, four years ago, could rule — as lower courts did in this very case — that Congress had gathered enough evidence before renewing the law in 2006 that the problem of discrimination continues so that preclearance is still a valid legislative approach. It is hard to imagine such a ruling without the Court adding that Congress has a constitutional duty to update Section 4′s coverage formula, or else it is constitutionally doomed. Jurisdictions that could remain covered by the preclearance requirement could be told that they must continue to obey Section 5, but emphasizing that each of those can come forward with hard proof that they have overcome the problem — and can satisfy an up-to-date Section 4 that Congress would have a duty to devise. The Court could conclude that Congress simply lacked the authority, in 2006, to maintain the preclearance requirement of Section 5, because that approach is inherently subject to covering too many jurisdictions, or too few, without a sound basis in on-the-ground political reality, thus denying states and their political subdivisions the ”equal footing” that Article IV requires and over-using the power that exists to enforce the Fifteenth Amendment. If the Court did that, there would be no need to separately address Section 4, because a coverage formula is not needed if Section 5 goes. Congress thus would be left with the option that, in practical terms, Section 5 would be dead unless it updated Section 4. The onus of letting Section 5 die would thus be on Congress, not the Court. Just as the Court passed up the opportunity in 2009 to strike down the 1965 Act’s provisions, it could do so again this time, and perhaps with a variation of the back-up approach it took then: expanding the opportunity for jurisdictions to declare themselves beyond the law because they no longer discriminate against minority voters. This is somewhat questionable, because it gets the Court into the business of rewriting a law of Congress, or at least seeming to do that. Under the law, a jurisdiction can get out from under Sections 4 and 5 if it can show a ten-year record of non-discrimination. It is difficult to know how that very specific formulation could be changed by the Court without it getting into actual legislative drafting. Perhaps the Court might strike down the ten-year “clean hands” record, and tell Congress to find something that makes it easier to bail out. The federal government and the other defenders of the 1965 Act are pushing the bailout option strenuously, in hopes that it would be the way to salvage Sections 4 and 5, and thus the heart of the Act. Having spent its time, and lawyers’ time, reviewing Shelby County’s case, the Court very likely will feel an obligation to decide it. But if it is totally stymied, or if it thinks that Shelby County’s situation does not make for a good “test case,” it always has the option of dismissing the petition without a ruling, and waiting for a better case — perhaps one of Texas’s two pending petitions, on its legislative redistricting plan (docket 12-496) and its voter ID law (docket 12-1028). That would put off a final ruling on the 1965 Act until the next Term, allowing the Court to think more about whether it is ready to give up on Sections 4 and 5. 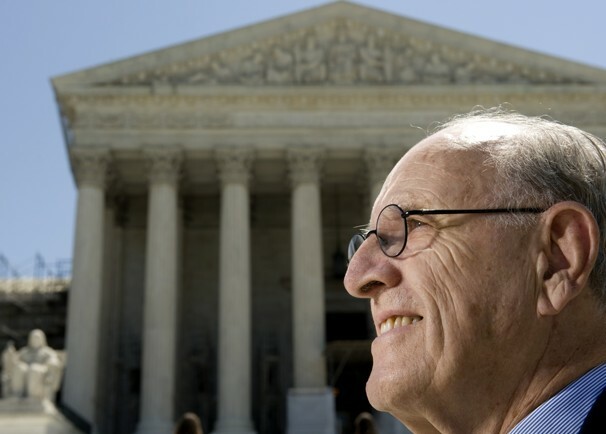 Be the first to comment on "SCOTUSblog’s Lyle Denniston on the Supreme Court and Section 5"